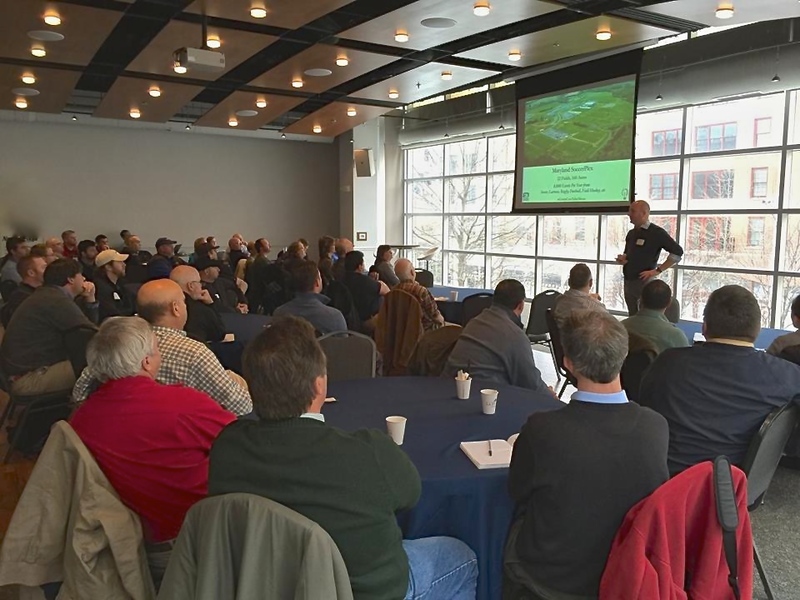 #GrassCanTakeMore successfully came alive this week in the first ever #GrassCanTakeMore seminar from Growing Innovations and Turf Republic in Rockville, MD on Tuesday. THANK YOU to the 81 participants that took part in the event. The exchange of ideas was fantastic! Your search for solutions and willingness to ask questions absolutely made the event a success! And THANK YOU to Mr. Dave Nehila and Mr. John Turnour for sharing with group and feeding the idea exchange. Wow, great! Additionally, Thank You to Genesis Turfgrass, Finch Inc, and Oakwood Sod for supporting #GrassCanTakeMore as the event sponsors. We couldn’t have done it without you! Look to @GrowingInnovations on twitter, www.growinginnovations.net and @TurfRepublic on Twitter, Facebook, and www.TurfRepublic.com for more information from the event. Also look for announcements for the next upcoming #GrassCanTakeMore events. New, creative, budget responsible solutions are marking it possible to improve grass field quality and meet that demand to increase use. #GrassCanTakeMore Grass Field Workshops bring you these solutions in real-life, usable steps to take home to improve grass fields. THANK YOU again to all of the participants. Grass Fields Can Take More! The perception that natural grass fields can’t sustain heavy use is starting to go away. There are a growing number of examples around the world of heavy use grass fields that are maintained in excellent shape. Even with smaller budgets. But still the “how much can grass take” debate still is ongoing. How much CAN a grass field take!? Truly so many factors are involved. Ultimately the examples of amazing fields around the world simply go back to using new and better tools for maintenance and also focusing on the skills of professional, creative, hard working Sports Field Managers. 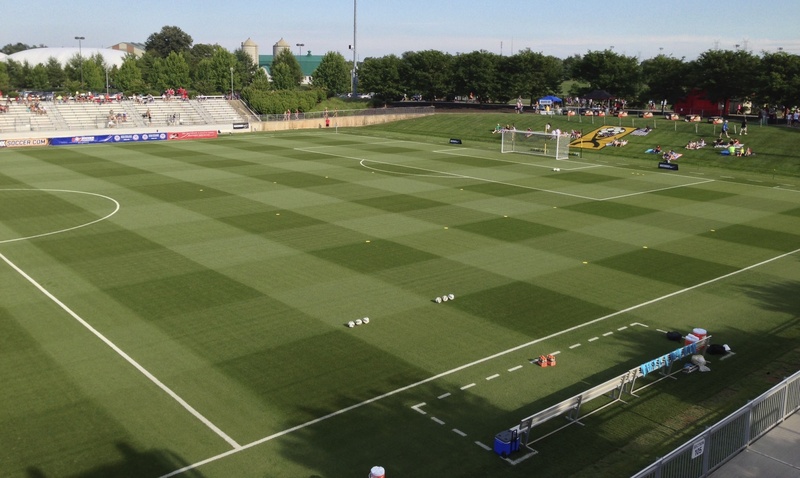 Maryland Soccer Foundation shared a wonderful example of how grass can take more this week in an article highlighting their Sports Field Maintenance crew on the STMA Professional Soccer Field of the Year, Hendricks Field. With that award, Hendricks recently became the first ever professional women’s field in any sport to win a Field of the Year award. 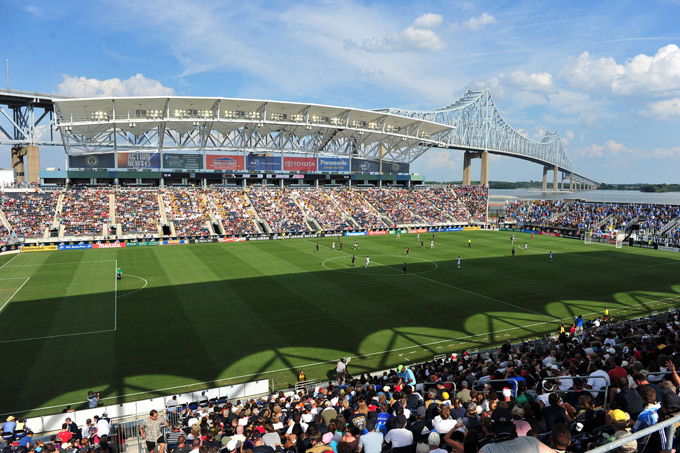 But even more unique, the field hosted over 750 hours of non-professional sporting events in additional to the professional use. Hendricks won 2011 Parks Soccer Field of the Year as well during a year hiatus of women’s soccer when the field hosted nearly 1000 hours of events. The field again made news in the fall of 2012 when it was renovated, re-seeded with Kentucky bluegrass, and re-opened 35 days after seeding. Wow! Certainly all of these amazing feats by 1 field seem like complete outliers because just a few years ago such high use at any level was thought to be impossible for grass. But now these things give as examples of the extremely bright and exciting future for natural grass fields and professional, creative, hard work Sports Field Managers. Using new and better tools for maintenance and by adopting new philosophies around the “3 Keys to High Traffic Maintenance” is changing what was once considered impossible and making it possible! Spreading How #GrassCanTakeMore: Take Part in the Upcoming Events! #GrassCanTakeMore is spreading around the world. With it, the possibilities of natural grass fields are multiplying! During the next few weeks, Growing Green Grass’s Jerad Minnick will be sharing those possibilities and exploring more ideas to help you learn more! Follow along with these events and to take part in the ideas and learning here at Growing Green Grass, or at @GrassRevolution on twitter. Hopefully you can take part in one of the upcoming events to ask questions, provide feedback and become a living part of the #GrassCanTakeMore movement! In search of new ideas for natural grass surfaces, Growing Green Grass visited JeffCo Schools Lakewood Memorial Stadium last week in Denver, CO. 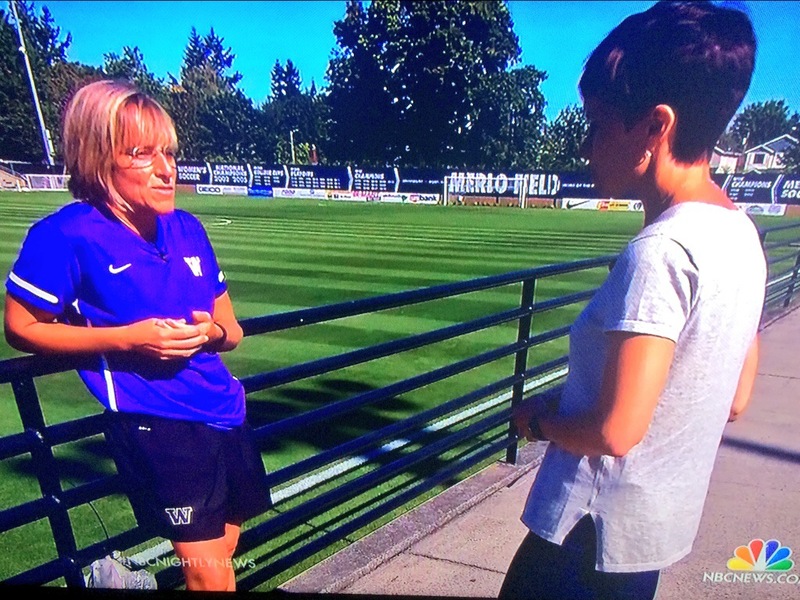 The Lakewood Memorial field features a new version of synthetic reinforcement for natural grass called XtraGrass. 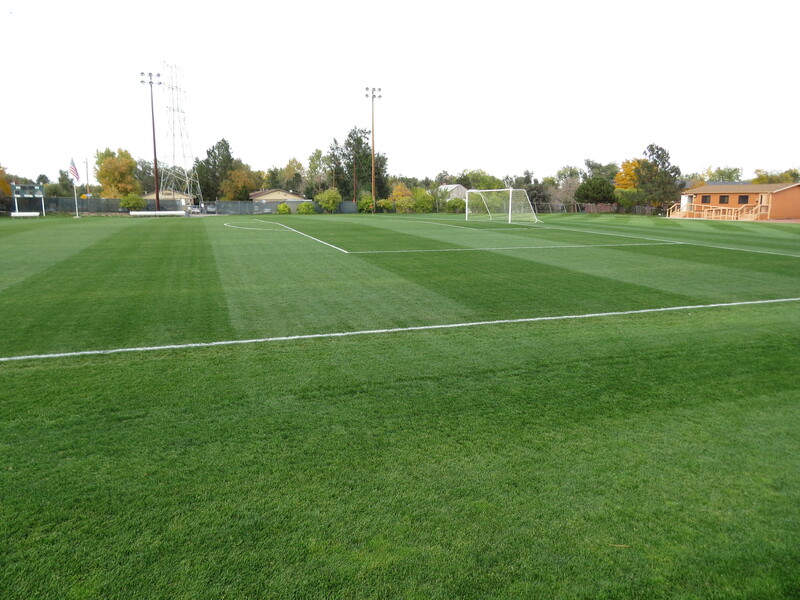 The field is a RPR/ HGT seeded field, and has had 60 soccer matches played in 60 days. The condition of the field was fantastic. Great work by Sports Field Manager Chris Gray and team at JeffCo Schools! Thanks Chris for having us! XtraGrass is essentially synthetic turf that is infilled with sand and grass instead of rubber, sand, cork, etc. Once XtraGrass is installed, the carpet “backing” begins to biodegrade and the natural grass roots through into the soil below. 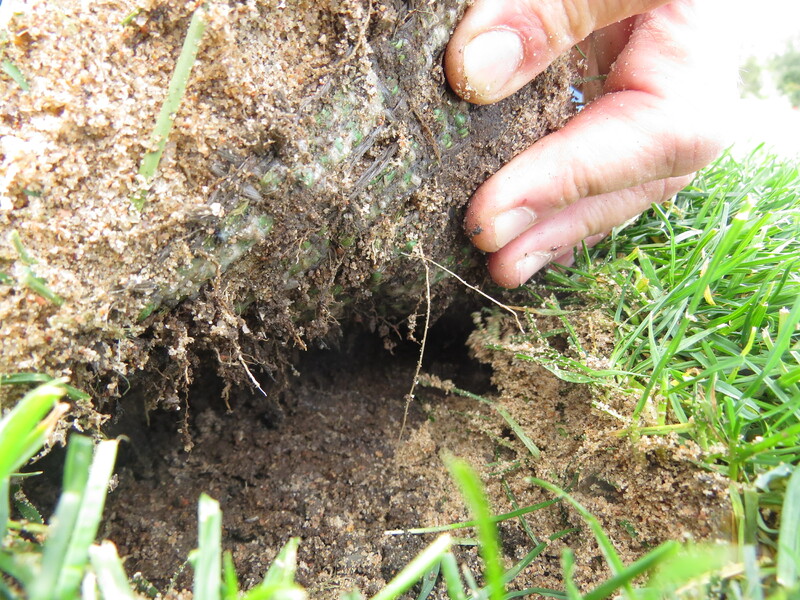 The synthetic fibers coming up through the sand protect the crown of the grass plants. 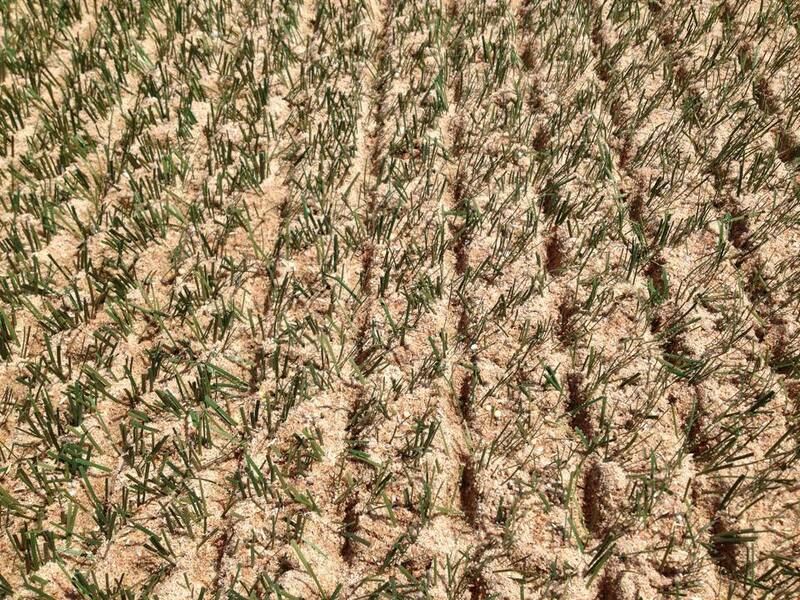 When a player stops, plants, turns, or pushes off, the synthetic fibers assist in footing and provide reinforcement to reduce shear and divots. Many of the 60 matches at Lakewood Memorial have been played in the rain, and absolutely no divots or tears were evident. Especially telling as the field was seeded only in late June and opened in late August. When the field begins to wear, the synthetic fibers provide continued stability and supply a green cast to the field. XtraGrass on its own without sand and grass infill achieves a FIFA 1-star rating. 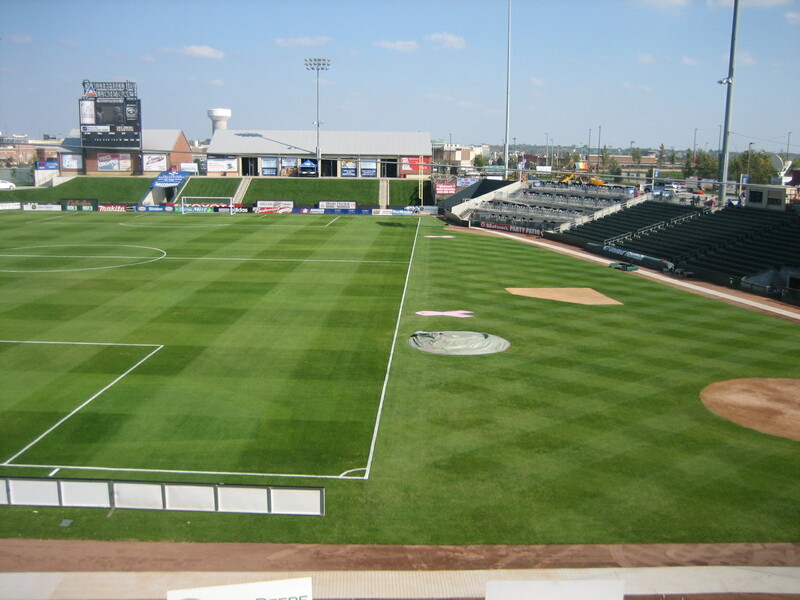 Maintenance of an XtraGrass field is relatively similar to any other high traffic grass field. Lakewood Memorial is not a big budget field; rather Mr. Gray is on a small budget with challenges that most all field managers can relate to. In regards to specific XtraGrass maintenance, regular aeration with solid tines/ deep tines to keep the field de-compacted is important. 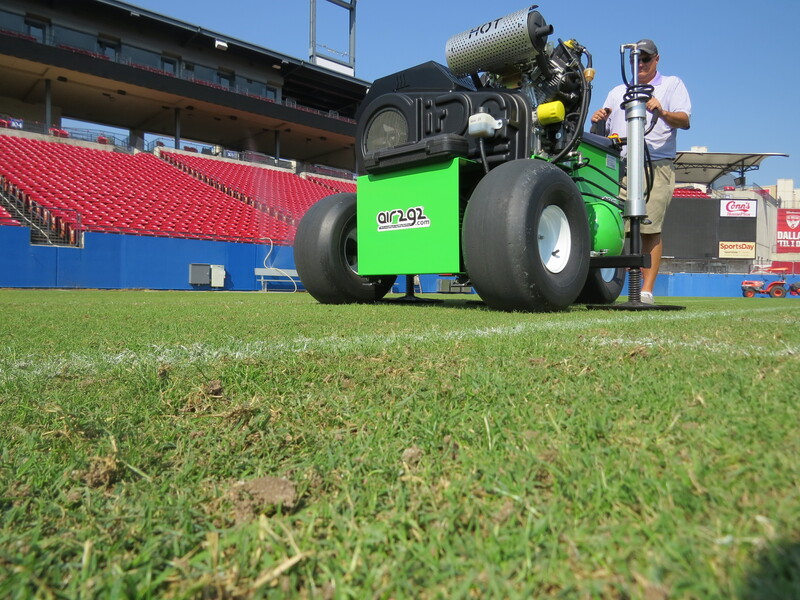 Core aeration is not possible because the backing will not go through the tines, but the top layer is sand and the grass is grown in from seed so there is no organic layer need to be opened up w/ core aeration. Dry-Ject, Air2G2, and such seem possible. As is slicing or spiking to promote rooting through the backing. At initial introduction, XtraGrass seems to be exactly what it is advertised to be. A natural grass/ synthetic hybrid system is scary to many because of the failures of products in the past. But because those failures in the past are understood, it is possible for such a product to work in the present and future. The Lakewood Memorial field is a high traffic, low maintenance example of how XtraGrass could help high traffic fields, especially in cool season climates where stability is an issue. Sports field managers and users are in need of a bridge product between full synthetic and standard natural grass… XtraGrass very much could be that bridge. We will continue to observe and update you… more to come! 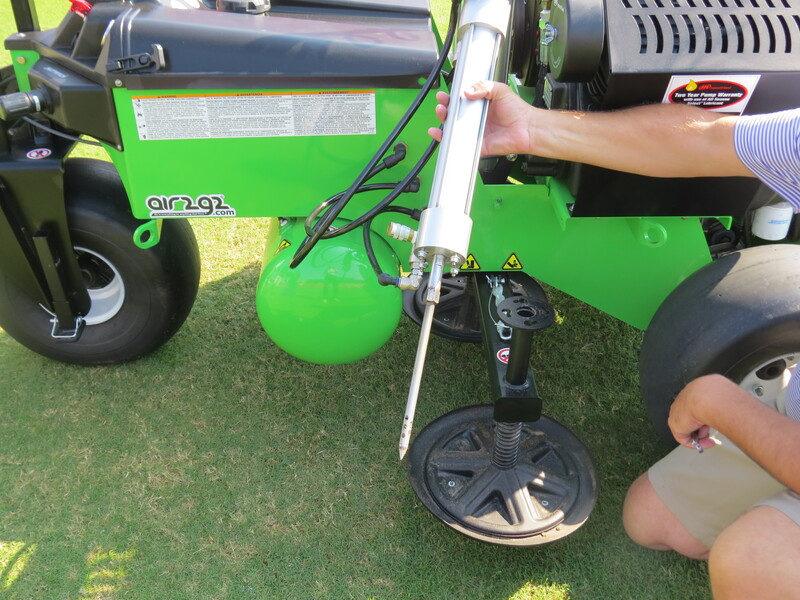 Air2G2 has gained exciting attention over the last year. The concept of pushing high-pressure air into the soil to fracture it to allow plant roots to breath certainly makes sense. Mr. Reed is currently aerating the high traffic areas on the field 1-3x/ week. (Yes.. you read that correctly. 1-3x/ week). Now that’s aggressive aeration! The results are evident too, nearly through high school football season the field is still magnificent. 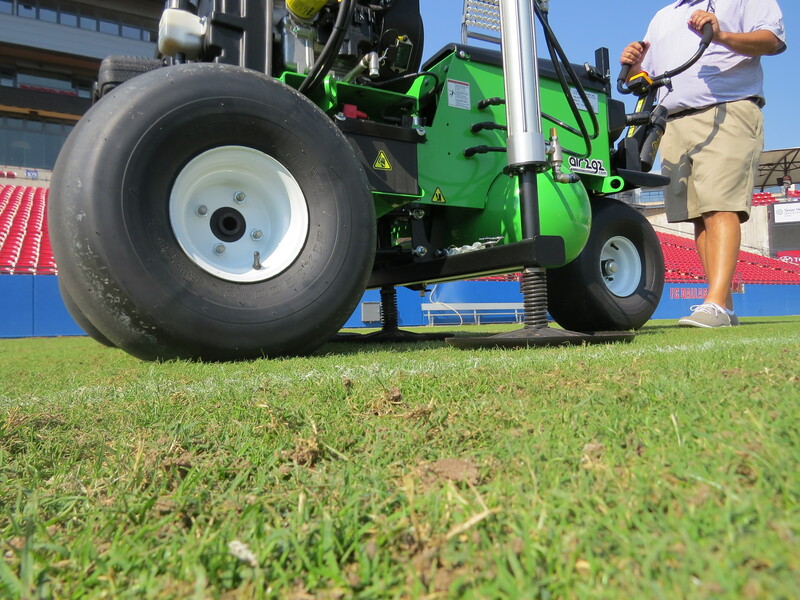 With such aggressive aeration being administered to the field, the expectation could have been that the Air2G2 machine would not make a significant impact. But not so! 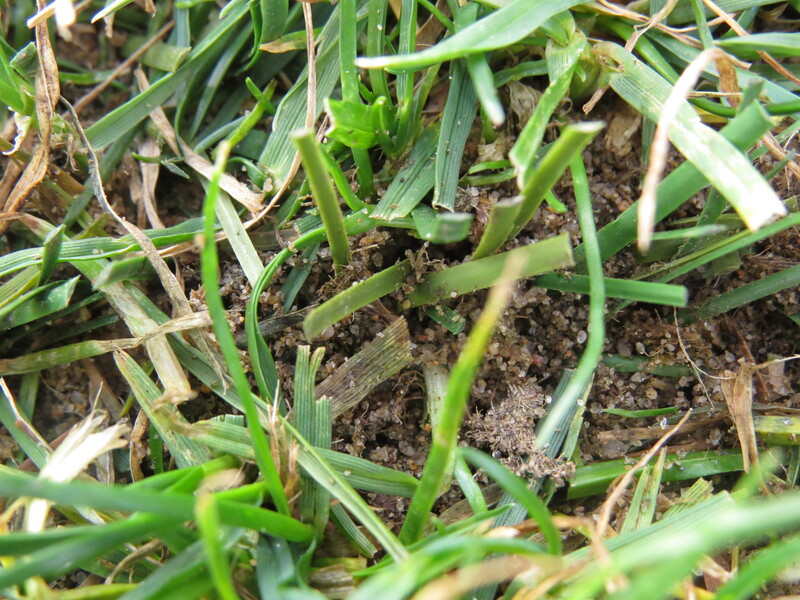 Even on sidelines that had been knife tined on 2″x 2″ spacing only 30 minutes before the Air2G2, the high-pressure air forced up through the sand still made a visible impact. The Air2G2 has 2 options on probe depth: 5” and 9” probes. There are 3 probes that can cover an area up to 5’ wide. The machine inserts the probes into the soil until they meet their first level of resistance. At that resistance, usually around 4”, the first blast of air is released. The probes, having softened the ground with the initial blast, then push down to the full depth where a 2nd blast of high pressure air is made. 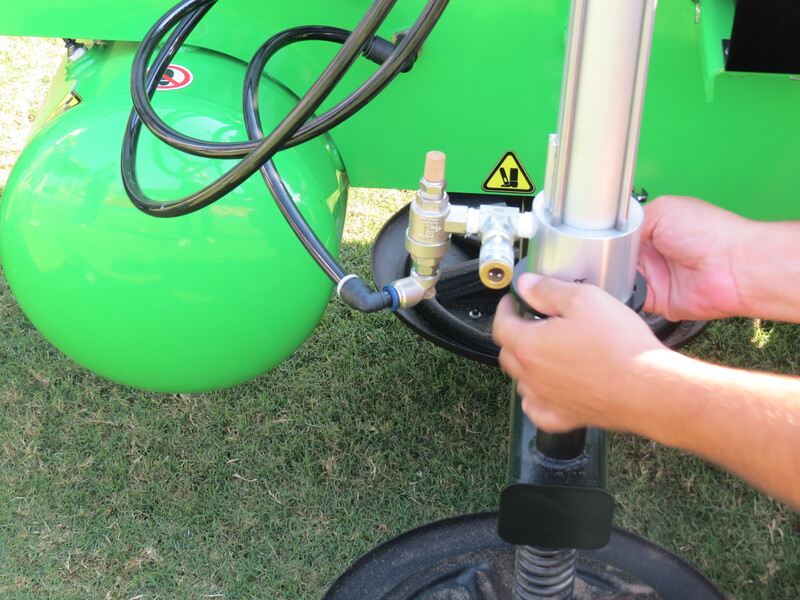 The Air2G2 machine is built with easy of operation in mind. Pressure is simply set for the pneumatic cylinders to push the probes into the soil. Pressure can be set equally as simple for the amount of air pressure to be pushed into the soil. An air tank on the base of the machine stores air to reduce the workload on the air compressor and the quiet 19-hp Koehler engine. The machine is very simple and comfortable to operate. Using a pentrometer, we were able to register a percentage of additional de-compaction on the field from the machine. There is scientific quantitative data becoming available from University of Tennessee on the compaction and surface hardness reduction. The results were somewhat obviously though from being able to witness the visible rising of the entire sand profile when the air was released 9” down. Amazing! The Air2G2 is a well-built machine using a fascinating concept of using high pressure air to de-compact or “air-ate” soil. This machine is sometimes being compared to the old Toro Hydroject, but overall it is nothing like that. The Hydroject was forcing high-pressure water into the profile, but only at the top. The Air2G2 de-compacts from the bottom up. Air2G2 is simple to operate and to maintain, with probes lasting for up to 15 acres. Yes, using the machine is a slow process, taking 6-8 hours to do a field. But really any good aeration takes time. The benefit far outweighs the time. If you get a chance to see a machine, take that opportunity!